my maudlin career. - Versicle. aaahh.. I wish I got a better picture of Lee..
my fave shots of Tracyanne. one shot with acoustic guitar and the other one with electric guitar. love the lighting here, too. she's so adorable and her voice is magic! woww!! you look so fresh with that outfit. you fit orange color perfectly. i really really like your scarf. i love everything about you and your outfit! TIKA YOU HAVE NO IDEA HOW MUCH I ADORE THIS LOOK ! that high waist short is probably the PERFECT slouchy shorts i've seen throughout blogging ! OMG.love this outfit.u match it well. babyy.. you look so pretty.. i super love the color pallete..the tone is my favorite one these days.. love love love! :D magnificent! i love this look!!! the colors are so pleasing to the eyes. i am droooooling over this outfit. im so in love with this outfit...! i absolutely love this outfit! the colors are so amazing! cute outfit! love your wedges kak! btw mind if we exchange links? your overall look is great but those shorts are amazing! Oh my gosh. I adore you. You have killer style + killer taste in music. I'm wondering, who took all of your outfit photos? Love the color palette in your outfit ! And also,the concert seems amazing ! great, you seems like a little french girl like this! You look lovely! Wow, especially that blouse-- what an amazing thrift find! Wow, your scarf is awesome. your shorts and scarf, i like!!! really cool blog. added you to my blog roll. hope we can exchange links. I love this outfit! The shorts and wedges are gorgeous! that would be such a fun concert to go to! my friend and i were watching some of their concert clips on youtube a few months ago and we had lots of fun. the outfit is BEAUTIFUL! no black (or at least hardly any black) looks great on you. the way you tied the scarf is so cute and i LOVE those shoes. i love your beret and that gorgeous scarf! I love love love this outfit! I can't even describe, it's just perfect. Thanks for your nice comment! Wauw, I love those shorts! Very cool outfit! so lovely and comfortable outfit!! love the color in this outfit and cute hate!! thanks for ur sweet comment! i like ur blazer, love the color so much !!! You look great! And yeah, no black.. hahaha... Will join your giveaway soon..
you look so cuuute! i love the wedges and you look fantastic in colours as well! Love this look, it's a little bit perfect... I always love your facial expressions too! So jealous of camera Obscura...I want to goooo. I just came across your blog. You look great. This outfit really is something special. I adore the combination of all the latest trends. You wear someting leather, something ethnic, big sleeves at the shoulders... AMAZING!!! I love your blog! i really really love your style. awesome and cool. you're soooo good. 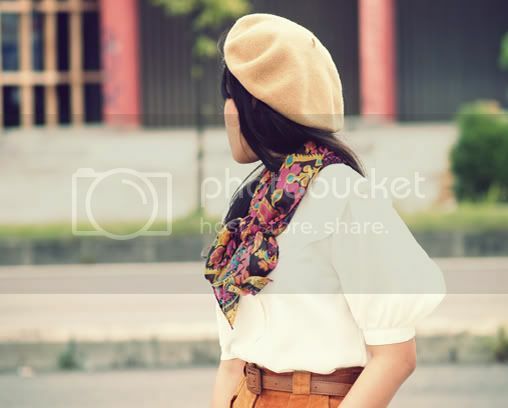 Absolutely LOVE your outfit - the color palette, your hat & your scarf! Wonderful pictures of Camera Obscura, love their music! this outfit is just perfect i love everything about it! im a big believer that shoes should match one of your accessories.. so i love that your shoes match your hat! so cute!! It reminds me of Paris, as many people have also said before.Tres belle, ma cherie! i am loving the color of your outfit!! your shorts & shoes are amazing!! you look fab!! That scarf is gorgeous and those shorts are so cool! I love the colour pallette of your outfit! I especially like the shorts! I'm so in love with your outfit. 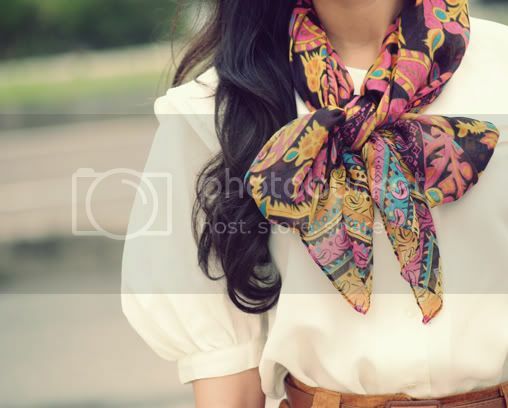 I lve that kind of shorts, and the scarf is so pretty. I really love how the scarf and the shorts play off of each other. Wonderful! And those shoes are beautiful!! whohooooooooooo!! Camera Obscura. My lifetime regretness not to watch their show, coz lotta works in weekend. Hate! baby.. you look prettier everday. i lovee this outfit. no black..hmmmm... yeahh.. very nice!!! ;m goin to YK in the middle of april. what do you think? i missed you too much. wanna exchange link anw ? you're always so perfectly styled! btw, is the thrift store where you buy the jacket and the shirt is the place where you work? I hardly find them in singapore! I am sure that she will look nice in them! wow! I heard that jogja have a lot of urban style shops rite? Oh love your shorts en shoes!! pretty! absolutely stunning outfit my love...looks fantastic!! !really gorgeous!! !love your shoes and your scarf...wonderful....wish you a nice sunday! This is such a great outfit and you look amazing!!! Love all the details: the colors, the little knotted scarf, the beret - it all comes together perfectly!! Love your blog!!! Su have such a great style! !